Posted by dutchgrub	on Thursday, April 22, 2010 at 16:20. 4 Comments. 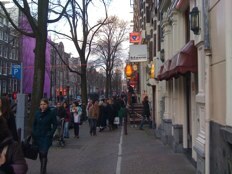 The red light district is certainly one of the main attractions of Amsterdam. It would appear just as certain that it’s the neighborhood to avoid when looking for great food. And that’s the charm of Blauw aan de Wal – amazingly good food and friendly service in the least likely yet most characteristic part of Amsterdam. Blauw aan de Wal is indeed located right in the heart of the most sinful part of the city. And you will be surprised just how pretty and quaint it is when you finally find Blauw, just across the canal from Casa Rosso and through a graffiti plastered alleyway. The building is centuries old, located behind a tranquil courtyard that makes a great terrace in the summer, and split into a more rugged lower part with bare brick walls and a more modern upstairs dominated by a modern, white chic. What we liked best of a great evening was the fantastic service: Highly attentive, extremely knowledgeable, with a good dose of humor and the attitude of a passionate foodie. The tone was set perfectly right from the start when we were asked whether “we had had a chance to inform them about our presence in advance” and were promptly offered an aperitif wine with the “freshness of a glass of Schweppes”. The staff, including owner Bert, magnificently anticipated our every need, be it taking orders, refilling our wine glasses or answering random questions of curious foodies. They knew everything about every dish and wine, took the time to explain all details, and were not afraid to make unusual suggestions. And best of all, the staff seemed to have as great time as the guests! 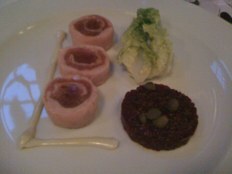 The formula at Blauw aan de Wal is a three-course choice menu for € 55,=. There’s usually a choice of three starters, two mains and two desserts. The cuisine is an interesting mix of Mediterranean and Asian with a touch of Dutch. The wine list is dominated by French and German wines, including some unusual grapes and smaller, organic vineyards. We absolutely loved our food, starting off with what Bert described as Blauw’s own interpretation of Vitello Tonnato – veal rolled up with sashimi grade tuna and just a bit of tarragon flavored mayonnaise. The mackerel tartar was great, too. 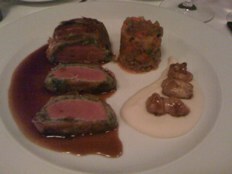 For mains we went with lamb in an herb crust with sweetbread that was very well executed. The lamb was tender and intense. The crust provided freshness and texture. And the sweetbread a prefect, succulent balance. The other main, halibut, was also very good. Blauw aan de Wal tries to provide options, but might not be an easy choice for vegetarians and pescetarians. 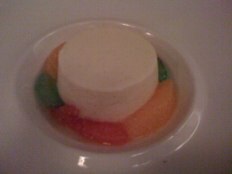 The dessert choices were flan with candied fruit and chocolate mousse with amarena cherries. The coffee was good and the free of charge sip of sweet red dessert wine was a nice touch. Overall, dinner was excellent. The location is a unique blend of Amsterdam’s insidious and picturesque sides. 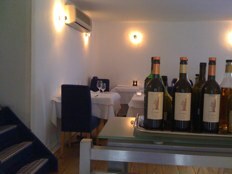 The food is very well executed and interesting while maintaining a welcome simplicity. 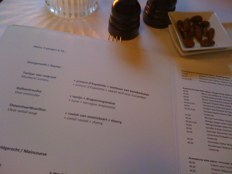 And most notably, the service is stellar, which unfortunately is still unusual in Amsterdam. The only downside of Blauw aan de Wal is a web site that has been “under construction” for quite a while. It would be nice to know the menu in advance and be able to make reservations on line. But for, don’t be deterred, and just give them a call and they’ll certainly be happy to help. Trams 4, 9, 16, 24 and 25 to Dam. Or walk from Central Station. Filed under amsterdam, best amsterdam restaurants, restaurant, wine. sounds really delish. who knew you could get good grub in the RLD besides chinese and thai? dutchgrub knew, that’s who! can’t wait to get back to the dam, man. Blauw aan de Wal is totally worth the trip! Great food and super friendly. And then right in the middle of the Wallen. Sure you would love it! Saw that you’re done with Qype. Understand. Hope you keep visiting dutchgrub. Glad you liked Blauw aan de Wal a lot, too. I definitely give them props for consistency! 3 years ago… Time for another visit, no?